Oslo design studio StokkeAustad has created a modular furniture system for Norwegian brand Elementa that can be easily expanded for changing workspaces. 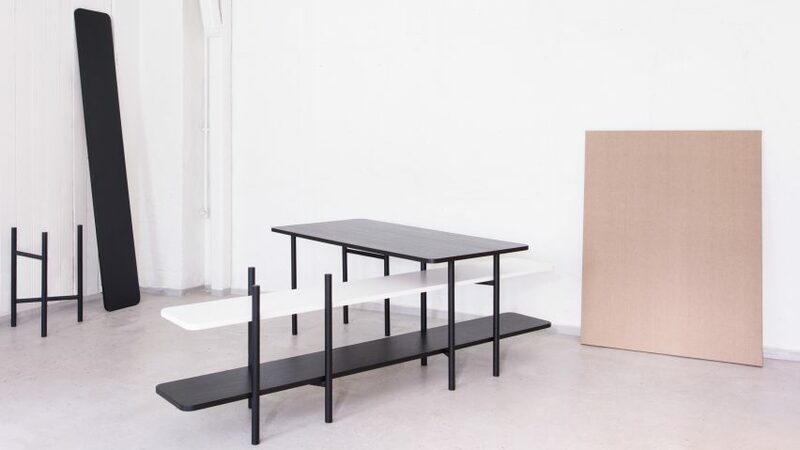 The minimal UN Divided furniture rests on a trestle base made from tubular steel, which can be adapted to support any size or shape tabletop. By changing angles, or combining several trestles, the furniture can be transformed into storage and shelving of various heights. 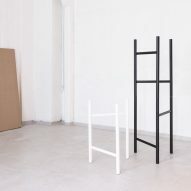 Designed for workers that often move offices or companies in the midst of expanding, the framework can also be folded up and stacked for storage when not in use. "Workers of today do not need loads of closed storage or complicated cable management," said StokkeAustad's Jonas Stokke. "Simple, functional and adaptable solutions with clean surfaces are the way forward, we feel." 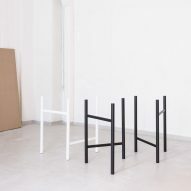 UN Divided trestles can be bought individually, or as desk, table or shelf sets. "The system allows for quick assembly and reconfiguration as needs change," said Elementa. 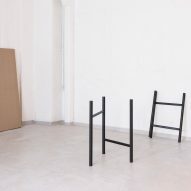 "Out of the natural placement of the base grows a series of elegant furniture pieces." "The graphical nature of the design allows for subtle architectural definition with minimal means." "Businesses are restructuring, expanding and changing quickly these days," said the company. "Modularity, done the right way, can make a lot of sense practically and economically." Several design studios have turned their attention to flexible workplaces. Note Design created fold-up office dividers for nomadic workers, and German designer Konstantin Grcic created a flat-pack system of desks that could transform into sofas. There has also been an uptick in interest in modular furniture for the home, as designers create pieces that can be adapted for small living spaces and longterm renters. Hungarian brand Hannabi's modular Urban Nomad sofa is tailored to those who move frequently, while UK design graduate Sam Wrigley released a collection of flat-pack designs to rival Ikea.